Preschoolers are such a fun age for crafts. They are discovering their own fine motor skills like using scissors, squirting glue, or mixing and painting with colors…whatever the craft! Little Miss. E, my 4-year-old, especially loves anything that involves paint, scissors, and glue. It’s fun to see her excitement and bond with her when we take on a new art challenge. Slowing down from life’s busyness and spending one on one time is a great way to make sweet memories. 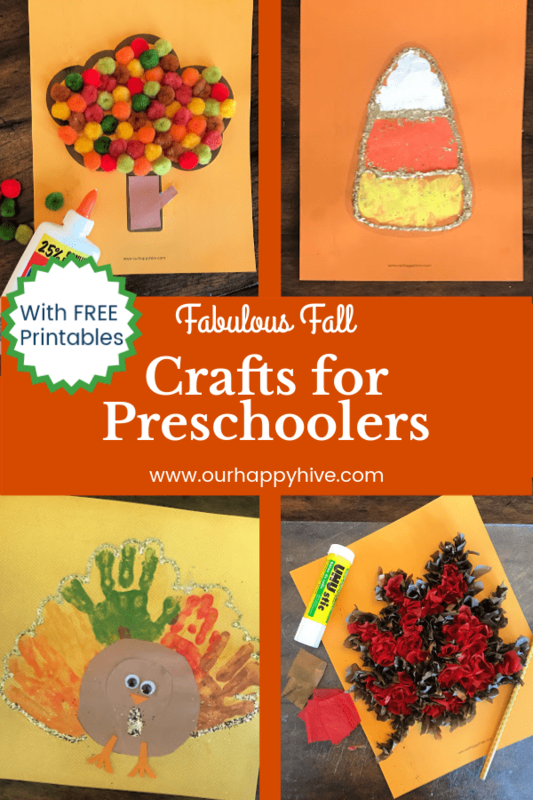 That’s why I’m excited to share with you these fantastic fall crafts for preschoolers. As a busy mom, I want to spend quality time with my kids, but I don’t usually have time to do a craft that’s super involved or difficult. Preschoolers also don’t have the attention span to focus on highly involved projects. The sweet spot of any craft for a busy parent and a young child is something that’s simple. That’s what makes these fall crafts for preschoolers so great! You can gather a few simple supplies, download my free printable at the end of the post, and easily do any of these crafts. Print out the tree on fall colored or white paper. Have your child put glue on the tree. Place pom poms on top of the glue and gently press down. Next cut out a trunk and branch out of the brown construction paper. Put glue on the back of the construction paper and place within the lines on the printout. 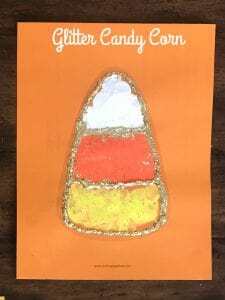 Print out the candy corn on fall colored or white paper. Use wine corks to dip in paint and stamp in the various sections of the candy corn. 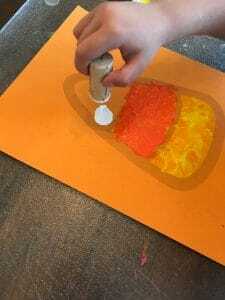 The cork is an easy way for young kids to paint and it makes it fun for them to use something different than a paint brush. Once the paint is dry, outline the candy corn with glue and sprinkle gold glitter on it. As you might imagine, this step can be pretty messy, so do it in a contained place, outside, or on top of a newspaper. 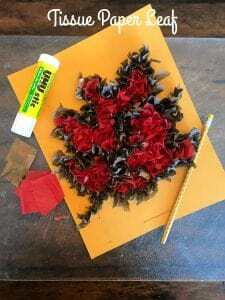 Print out the leaf on fall colored or white paper. Cut the tissue paper into small squares, about 1.5 x 1.5 inches. Wrap the tissue paper around the eraser end of the pencil. Dab the tissue on the end of the pencil on the top of a glue stick. Then place on print out. We outlined the leaf first, but you can do it a variety of ways. Your preschooler can use a variety of colors and put them in a random order or they can do the entire leaf in one solid color. So, this one was by far my daughters favorite. She loved having her hand painted. According to her standards, the messier the better. Moms, don’t get too stressed, it really wasn’t too much clean up. Paint your child’s hand. Start by placing the first-hand print in the top third of the page in the middle. Next, paint hand a different color and repeat the process fanning out two handprints on the left of the middle one and two on the right of the middle one. Trace two circles on the brown construction paper then glue on top of the large paper with the handprints. I traced a bowl for the larger circle and a glass for the smaller circle. Cut the circles out and glue one on top of the other. Glue the googly towards the top of the smaller circle. Cut out a beak and the feet from the orange paper and glue. If you want to jazz it up a bit, let your child use some glitter paint to cover his/her handprints with glitter. (By the way, glitter paint is much neater than traditional glitter). 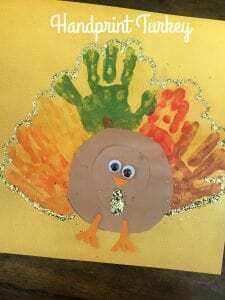 Crafts are always a big hit with kids of all ages, but preschoolers in particular love the joy of discovery, the attention provided in the 1 on 1 time, and having fun together. Don’t try and tackle all of these crafts at one time, you’ll get frustrated and likely will lose your child’s attention. Choose 1 or 2 crafts to do at a time. Do them over a couple of weekends or during an afternoon after school. These fantastic fall crafts for preschoolers are guaranteed to be a hit with your little one. They are easy for mom, fun for kids, and will create sweet memories for a lifetime! 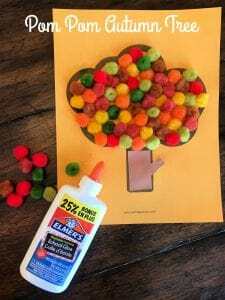 Don’t foget to grab your free copy of the printables of the Autumn Tree, Candy Corn, and Fall Leaf by completing the form at the bottom of the post!